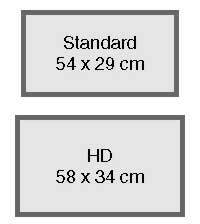 When choosing eTray sizes there are two things to think about. The first is whether the eTray will be large enough for your equipment; the second is how much room you need to allow for your mouse. The sizes shown below are for the flat, usable area of the tray deck and do not include the frame which rises about three millimetres above the surface level of the deck. It is possible to allow your laptop to overhang the frame, but to avoid problems with overheating it is important to ensure that the airflow underneath the machine is not restricted. 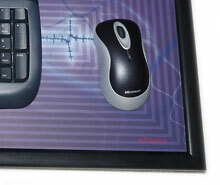 The amount of room required for a mouse depends on your personal preferences and the type of applications you use. My suggestion is to allow an absolute minimum of 150 mm for this purpose – 200 mm should be adequate for everybody. It is possible to operate a mouse in a much smaller space by adjusting the pointer speed settings and by learning to scoot the mouse. You can choose your deck design in either of the following sizes from the eTray Gallery page. Standard This is the original size for eTray that we started manufacturing back in 2004. 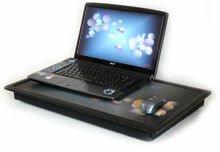 Its 54 x 29 cm deck is best suited to a 15.4 inch widescreen laptop or smaller, but we have heard of people who use them happily with 17” machines. HD This is the same construction as a standard eTray, but the deck is extended to 59cm x 34cm. This provides room for machines with 16" or larger HD screens.